Trooper Hyman Pearlman of "Herzlton", Boggabri, a member of the 2nd Cavalry Brigade, in a photo taken 1938 or 9. 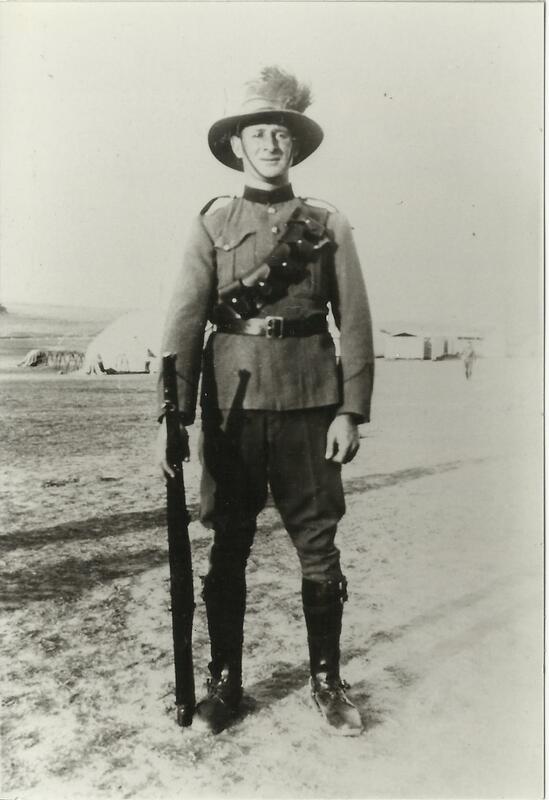 Note that he was wearing the classic Australian Light Horse plumed digger's hat, with a bandolier worn across his chest. The collar on his tunic appears to be distinctive of his Brigade. Hyman (known as Hymie) served in the Cavalry in World War II, but not on a horse ! His active service was in Cyprus, Palestine, and at Sanananda, New Guinea. For an account of the cavalry units known as the Australian Light Horse see the Wikipedia article. Hymie's brother Mark Pearlman, although 14 years his senior, also served in the Australian Defence Forces during WW2.